I love this cool backpack. 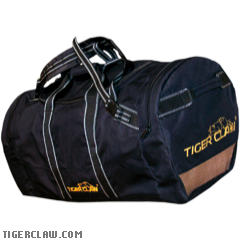 It has places to stash everything you will need for your workout or martial arts classes and more! There are spots to put your laptop, mouthpieces and even a supply of juice boxes. Tote your water bottle upright in the elastic pocket. The main compartment measures 18"x10"x8" with the internal laptop pocket being 10"x9.5"x1.5". It is constructed out of polyester and has an ergonomic padded shoulder harness with sternum strap for carrying with ease and features hideaway straps as well. There are fleece lined pockets for sunglasses or sound equipment. It has 7 zippered pockets in all. Talk about stash spots, this gear bag is loaded with them! With the GurlFytrz logo printed on the bag, it is indeed stylish. It has a spot for a laptop, mouthpieces and enough space for 60 juice boxes. The main compartment is 18"x10"x8" and the internal laptop pocket is 10"x9.5"x1/5". It is a good idea to measure your laptop to make sure it will fit in the pocket. Made of Polyester, the bag has an ergonomic shoulder harness that is padded as is the back straps. It has a vertical sternum strap, and hideaway straps and a fleece-lined sunglass/sound pocket. There are 7 zippered pockets in all plus a handy elastic water bottle pocket. This tote bag has the GurlFytrz logo on the black fabric and has a pocket for a cell phone on the removable shoulder strap. It is expandable too. If you want to go with a simple bag, this one is as simple and lightweight as they get. The mesh netting will keep your gear from mildewing when wet and allows your sweaty gear to air out. The meshing is tight enough to keep your gear from falling out. It measures 28"x18" and has a locking drawstring closure. 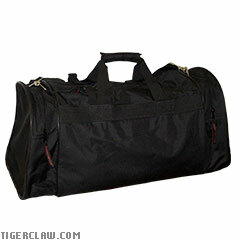 If you are looking for an inexpensive yet serviceable bag, this one fits the bill. It is all black with a cell phone pocket on the removable shoulder strap and is expandable as well. For the price, this one is a nice bag. 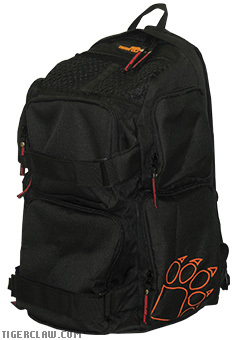 This black embroidered gear bag has great storage and sturdy construction and so you can display your affliction in pride. It features a main compartment and a double-zippered opening along with two red side pockets. It has a inner pocket for handy storage of small items and measures 26"x12"x12.5. 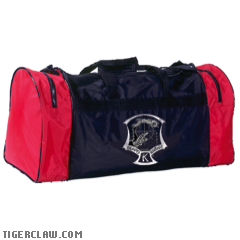 This embroidered gear bag is red, white and blue and has great storage space and sturdy construction as well. The bold embroidery proudly displays your affliction. Each bag features a spacious main compartment that sports a double zipper opening with two side compartments plus a handy inner pocket for smaller items. It measures 26"x12"x12.5". This Kenpor Gear Bag is an official Ed Parker complete with registered trademark logo that looks great. 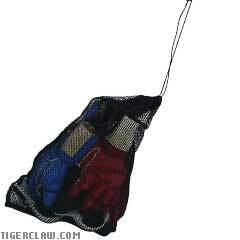 It has a protective lined inside and is constructed of sturdy nylon. There are two vented zippered compartments and one zippered pouch inside one of the compartments. The Kenpro Gear Bag has a padded shoulder strap with a cell phone pouch on it and measures 26"x11"x13". I like this bag for competition and traveling. It is spacious and converts into a backpack. 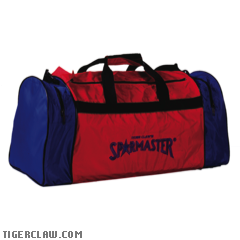 It is constructed of nylon so it is sturdy and has 3 handy zipper pockets for storage. The bag comes in small or large. Small measures 24"x12"x12" while large is 30"x13"x14".